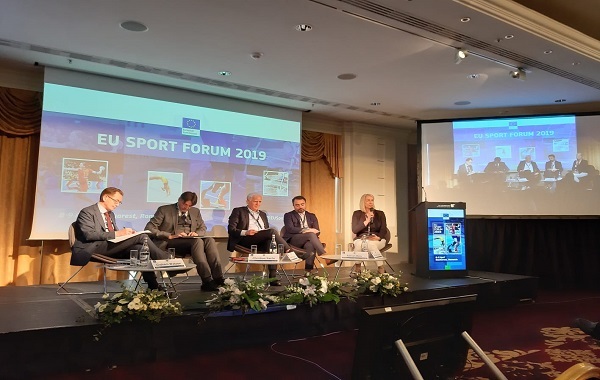 EuropeActive took part of the 6th EU Sport Forum held in Bucharest on Monday 8th and Tuesday 9th April 2019. The EU Sport Forum is the main platform for structured dialogue between the European Commission and sport stakeholders. The Forum's main objective is to take stock of progress achieved in implementing the EU agenda for sport and to seek stakeholders’ views on current and planned/possible future activities. EuropeActive President, Sir Graham Watson joined as speaker the last plenary session about “how Europeans will engage in sport in the future”. He presented his view on the future challenges to promote physical activity and how sport stakeholders should react. The 2020 Forum will be organised in the framework of a new Parliament and Commission that will hopefully continue the same path of the current Institutions. Indeed, in five years, the financial support to sport policy has increased together with the funds to sustain EU projects. At the same time, EuropeActive looks forward to continuing giving its contribution in EU-wide initiative such as the European Week of Sport.